On August 4, 2001, the live show The Bear in the Big Blue House Show had its final performance in Disney-MGM Studios (now known as Hollywood Studios). The show had played for over a year, and featured the characters from the hit kids television show Bear in the Big Blue House singing songs. The show was replaced by Playhouse Disney: Live on Stage, which had segments featuring the cast of Bear in the Big Blue House. Posted in Uncategorized and tagged 2000s, Attraction, Closed, Disney Park, Hollywood Studios, Live Show, Playhouse Disney, Walt Disney World. Bookmark the permalink. On September 16, 2006, the educational animated series Handy Manny premiered on the Playhouse Disney programming block on Disney Channel. The series featured Latino character Manny Garcia, a handyman that works in the multicultural neighborhood of Sheetrock Hills to fix various problems. The show helped teach children problem-solving and conflict resolution skills, as well as basic Spanish words and phrases. The series ran for 113 episodes, and was created by Roger Bollen, Marilyn Sadler, and Rick Gitelson. The series featured Wilmer Valderrama as Manny, Carlos Alazraqui as Felipe, Dee Bradley Baker as Turner, Nike Futterman as Stretch and Squeeze, Tom Kenny as Mr. Lopart and Pat, Kath Soucie as Dusty, Fred Stoller as Rusty, Nancy Truman as Kelly, and Grey DeLisle as Flicker. Posted in Uncategorized and tagged 2000s, Animated Series, Disney Channel, Playhouse Disney, Television. Bookmark the permalink. On July 4, 1999, the Bear in the Big Blue House Show premiered in the Disney-MGM Studios Park in Walt Disney World. Based on the hit Playhouse Disney show produced by Jim Henson Productions, the show featured the characters of Bear, with his friends Ojo, Treelo, Pip, Pop, Shadow, and Luna. It was housed on Soundstage 5, and the 15-minute show had guests sitting on a carpeted floor. The show ended its run on August 4, 2001, and was replaced with Playhouse Disney – Live on Stage, which included several characters from this show. Posted in Uncategorized and tagged 1990s, Attraction, Closed, Disney Channel, Disney Park, Live Show, Playhouse Disney, Walt Disney World. Bookmark the permalink. 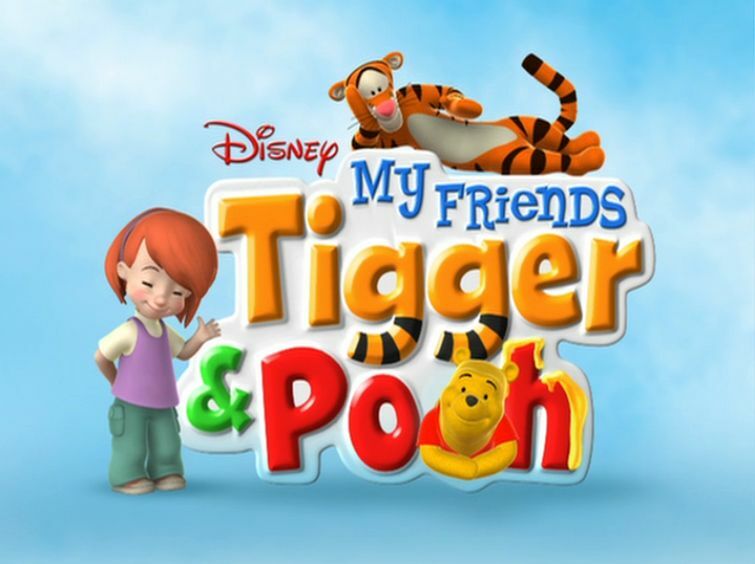 On May 12, 2007, the computer animated series My Friends Tigger and Pooh premiered on the Disney Channel’s Playhouse Disney programming block. Based on the hit Winnie the Pooh series by A.A. Milne and popularized in film by Disney, the show features 6-year-old Darby and her dog Buster spending time with Winnie the Pooh and Tigger in the Hundred Acre Wood. The series ran for three seasons with 87 episodes, along with three direct-to-video films. The series was created by Bobs Gannaway, and starred Chloe Grace Moretz as Darby, Dee Bradley Baker as Buster, Jim Cummings as Winnie the Pooh and Tigger, Travis Oates as Piglet, Peter Cullen as Eeyore, Ken Sansom as Rabbit, Kath Soucie as Kanga, Max Burkholder as Roo, and Oliver Dillon as Lumpy. Posted in Uncategorized and tagged 2000s, Color, Computer Animation, Disney Channel, Playhouse Disney, Television. Bookmark the permalink. On October 20, 1997, the Disney Channel show Bear in the Big Blue House premiered. Produced by Jim Henson Productions in association with Disney, the show became a huge hit for the channel, running for five seasons with 118 episodes. The show centered around main character Bear, who lives in a big blue house in the middle of Woodland Valley with his friends Tutter the mouse, Pip and Pop the otters, Ojo the bear cub, Treelo the lemur, Shadow, Luna the Moon, and Ray the Sun. The show spawned several albums, merchandise, and even a live touring show. The characters were acquired by Disney when Disney bought the franchise, along with The Muppets, in 2004. Posted in Uncategorized and tagged 1990s, Color, Disney Channel, Emmy Award Winning, Muppets, Playhouse Disney, Television. Bookmark the permalink. 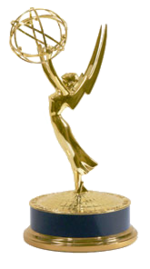 On May 14, 2005, the 32nd Annual Daytime Emmy Awards were held simultaneously at the Marriott Marquis Hotel in New York City and the Grand Ballroom at Hollywood and Highland in Los Angeles, California. At this ceremony, two Disney Channel shows won awards for Creative Arts: Melissa Ellis and Fil Brown won Outstanding Sound Mixing – Live Action and Animation for Kim Possible, Rossen Varbanov was awarded for Outstanding Individual Achievement in Animation for his work on the Brandy & Mr. Whiskers episode “The Monkey’s Paw,” and Rolie Polie Olie won for Outstanding Special Class Animated Program. Kim Possible had three other nominations, including Outstanding Children’s Animated Program, while Rolie Polie Olie and Brandy & Mr. Whiskers won in the only categories in which they were nominated. Posted in Uncategorized and tagged 2000s, Animated Series, Disney Channel, Emmy Award Nominated, Emmy Award Winning, Playhouse Disney, Television. Bookmark the permalink.